All available scores for Rock 'N Roll are in the section below. 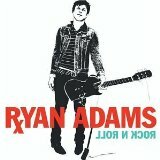 This piece of music was composed by Ryan Adams (also known as David Ryan Adams). We'd like to encourage you to leave a customer review for the sheet music for Rock 'N Roll. To do this log in, or create an account if you haven't already got one, then choose a unique screen-name (which is seen publicly), and off you go. If you are on Twitter or Facebook, and you would like to tell your friends about this piece of music, then please navigate to the share icon where you can choose from a variety of social media platforms to share this song. You can choose from 1 arrangement for 1 instrument for the composition Rock 'N Roll.